Swiss artist of outstanding range and talent. Famous in Switzerland and France, where he spent most of his working life, but little known outside these countries. "The Disciples Peter and John running to the sepulchre on the morning of the Resurrection"
This picture belongs to the Musée D'Orsay in Paris. It is one of his best known and is widely reproduced. Read "The greatest Easter painting ever made"
Possibly his most iconic picture, it is displayed in the Eugène Burnand Museum in Moudon, Vaud, Switzerland. The aim of this site is to make Swiss artist Eugène Burnand and his work better known in the English speaking world. 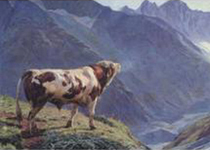 Here are examples of the pastoral and alpine pictures in Switzerland and France that made his name. There are also examples of his historic and religious pictures that came later on, and his numerous illustrations for classic books. The Main Feature for current attention is the unique collection of 104 pastel portraits of First World War "Military Types". Fourteen nationalities from all walks of armed service life, each with a description of whom they represented by military historian Robert Burnand. Five examples are below. Click one to see the full page. There is more information at the bottom of the pastel index page which shows thumbnails of all the pictures which link to the full sized picture with relevant texts. 72 of the original pastels are on display in the Musée de la Légion d'honneur in Paris (opposite the Musée d'Orsay), which owns 101 of the pastels. Three pastels are in the Musée Eugène Burnand in Moudon.This unique collection of portraits is of special relevance in the marking of the Centenary of the First World War between 2014 and 2018. There is information about publications about the artist on the books about Eugène Burnand page, and a page describing his museum in Moudon, Switzerland. To locate Moudon on Google maps click here. If you own a work by this artist I would like to hear from you. Many of his numerous works have become 'lost' or were never recorded in the first place. He was usually careful to sign his works 'Eug. Burnand' fairly clearly. I would also like to hear from relatives of the subjects in the pastels. I have already been contacted by some. Many, if not most, are unaware their great uncle or great grandfather was painted by a famous artist. Details of their subsequent life make a fascinating postscript if relatives permit me to add it.